Jazz to me is a living music. It's a music that since it's beginning has expressed the feelings, the dreams, the hopes, of the people. The only musician ever nominated for an Oscar was Dexter 'LTD' Gordon (Long Tall Dexter) for his role in Bertrand Tavernier's "Round Midnight." In Tavernier's jazz classic, Dexter plays expatriate Dale Turner, a great creative artist, revealing the pain which often accompanies the exploration of beauty. On October 16, 1986, I had the pleasure of attending the Hollywood Premier of "Round Midnight." I was a guest of KLON, Long Beach. They were playing one of my charts at the time. Seeing and hearing Dexter in person was an exciting and emotional experience. But seeing the 'sophisticated giant' (he stood 6' 5" tall) and foremost tenor saxophonist of the be-bop era on the silver screen was an experience I will remember as long as I live. Producer Tavernier hired Gordon for the leading role in "Round Midnight" after paying him a visit at his New York apartment. He was bewildered by what he saw. "I had to wait because he was sleeping, but when he entered the room I was really affected, just by the way he walked. Watching him come into the room, I had the impression that he was going to fall down and die on the spot. I don't know who else could project that." Gordon's portrayal of Dale Turner in the film was truly captivating. When he was on stage, that's all you could see. He dominated the screen with his presence and his raspy voice, which is probably a few octaves below the average human voice. On the film set Gordon hung photographs of Charlie Parker and Lester Young in his trailer. Before every scene, he would meditate upon them. He told Tavernier that he felt a responsibility to the two idols because he had an opportunity to bring their jazz personas to the screen. At one point in the film, Dale Turner visits a French psychiatrist to discuss his pain. With a hands-out-from-his-head gesture he tells the shrink, "My life is music...my love is music..." and with hands moving he finishes, "and it's twenty-four hours a day." Dexter was born February 27, 1923 and raised in Watts, California. His father was a Los Angeles physician whose patients included Duke Ellington and Lionel Hampton. 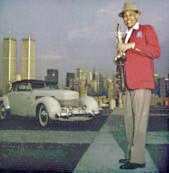 While in his early teens, Dexter was inspired by the sophisticated sound of Lester Young. Later he mastered the extroverted resonance of Illinois Jacquet and the complex harmonies of Charlie Parker. 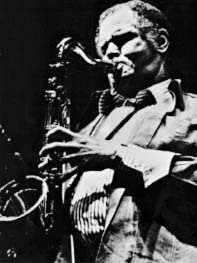 Dexter was the first 'real' be-bop tenor saxophonist. At 17, he started with the Lionel Hampton orchestra, and before he was 30, he had been on stage with some of the top names in jazz history, including Louis Armstrong, Charlie Parker, Miles Davis, and Billy Ekstine; his be-bop-chops were glowing. In 1962, Dexter played a two-week gig at Ronnie Scotts in London. Here he premiered his laid-back behind-the-beat phrasing. The gig was so successful he decided to stay on. He found the racial climate quite relaxed, and eventually he settled in Copenhagen. During his fifteen-year stay in Europe, he made a few sojourns, one to Storytown in New York. On opening night, the place was full of fans. Gordon received a standing ovation after every set. One of his fans that night was Bruce Lundvall, president of CBS Records Group, who offered Gordon a recording contract. 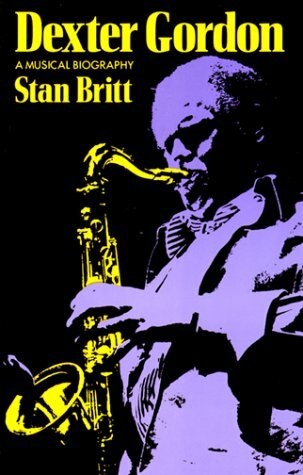 In 1978 and 1980, Downbeat Magazine named him "Musician of The Year," and in 1980 he was elected to the Jazz Hall of Fame. Gordon had a remarkable comprehension of the harmonic structure of chords. As Jimmy Heath once said, "Nobody knows chords like Dexter." From his album, "The Best of Dexter," when we listen to his a cappella coda at the end of "Body and Soul," we hear an emotionally commanding exhibition of saxophone prowess. When it came to playing ballads Dexter Gordon had no equal. In an interview, Dexter had this to say about ballads: "When you know the lyrics to a tune...you have some kind of insight as to its composition...if you don't understand what it's about, you're depriving yourself of being really able to communicate this poem." With longish tones emanating from the lowest register of his horn, Dexter ranks among the most thoughtful and articulate ballad players. Before Dexter gave the downbeat for a ballad or an up-tempo standard, he usually spoke the first few lines, and sometimes, the first eight bars, of the lyrics. And when the tune came to an end, Dexter's method of cutting the band off was anything but conventional; with his horn hanging from his neck, his arms out to the side, he would do a few half-knee bends while his side-men exercised a few moments of musical freedom. With one last knee-bend, his hands would come down, ending the tune. 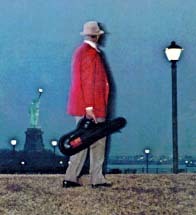 On Wednesday, April 25th, 1990, this free-spirited signatory of the be-bop era did his last gig...here. However, it is my intuitive and spiritual guess that Dexter is fronting his own group at 'that big gig in the sky.' He may not have been aware of this, but he gave inspiration and hope to so many musicians and non-musicians alike. I am one of those musicians. THANK YOU DEXTER. Herman Leonard's Great Jazz Photos - The Barbara Gillman Gallery represents the work of Herman Leonard. Tuxedo Junction - "devoted to jazz and big band music."